Dr. Stephanie grew up in Western New York but decided to make North Carolina her home in 2005 after completing her undergraduate degree. Dr. Stephanie had a desire to be a dentist at a very young age and she considers it a blessing to have a career that is her calling. 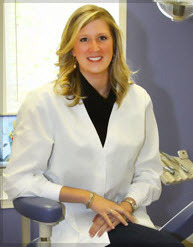 She received her bachelors in Dental Hygiene and her Doctorate of Dental Surgery from West Virginia University. Her unique background includes working as a dental assistant in Orthodontics and as a Dental Hygienist in Periodontics prior to becoming a dentist. She has dedicated her life to furthering her education in dentistry in order to provide the most thorough and comprehensive dental care. Dr. Stephanie is well regarded by her patients for her compassion and understanding. She believes in conservative and preventative dentistry and her goal is to provide dentistry in a caring and relaxed atmosphere. Dr. Stephanie is married and has two children. When she is not working, she and her husband, Erol, enjoy spending time with their daughters, Lenna and Kayli.